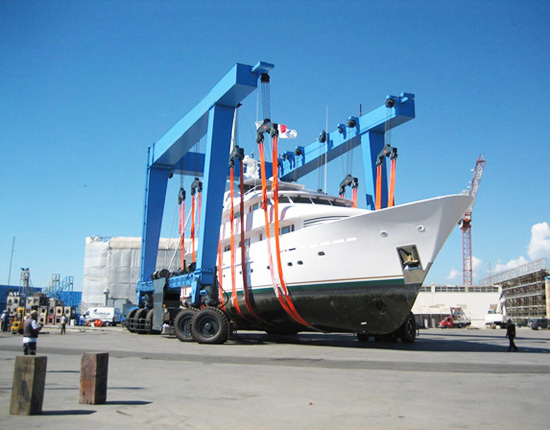 Marine boat hoist is a kind of boat handling equipment that is specially designed to lift, transport and park boats with ease. 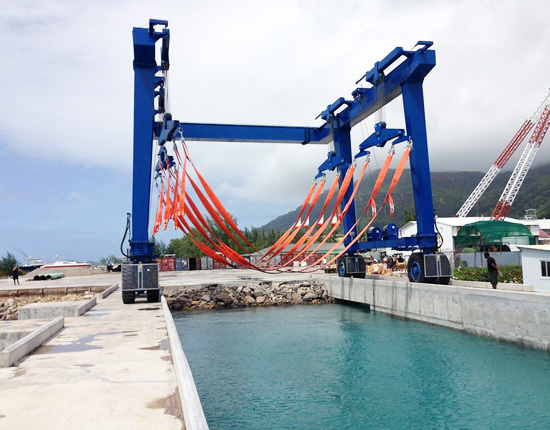 Mounted on rubber tires, this equipment can travel throughout the shipyard or marina. It is also designed with several different steering modes, allowing it to accommodate even the confined space. The boat hoist is generally hydraulically driven to deliver great durability and high strength. 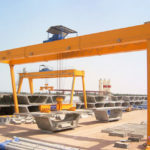 In some small capacity light-duty applications, we can design a cost-effective electric driven marine hoist to meet your business’s lifting requirements. Quality travel lift slings – the sling’s position can be adjusted to improve load placement. In other words, it can evenly support the hull of the boat without causing damage to its surface and structure. Different steering mode options – fixing axle steering, 90 degree steering, Ackermann steering, etc. Movable lifting points – the lifting points can be adjusted to ensure a synchronous lifting. Articulated main and end beams – reducing structural stress when travelling on uneven ground. Variable span – it can be adjusted to accommodate your boat configurations. Trolley and winch systems – low maintenance, easy assembly. Control options – remote control, cabin control. Hydraulic drive system – reducing energy consumption. Durable paint system – for better corrosion resistance in salt-water environments as well as for better appearance. Custom design – it can be tailored to meet your special lifting requirements. 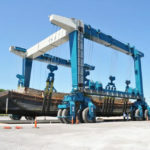 Boat hoist, as known as boat lift, travel lift or boat crane, is engineered for different purposes, such as launching a newly built vessel into the water, lift a boat out of the water, transport to the desired location and park these boats in the yard. 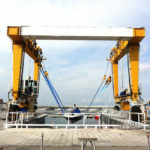 It is designed to lift and move a boat with ease, improve efficiency, reduce accidents in the boat handling process, as well as reduce boat damage. 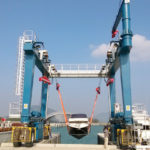 Our marine boat hoists are capable of handling a variety of vessels, such as yachts, workboats, sailboats, fishing boats, barges and tugs with capacity in a range of 25 tons to 1200 tons. They can also be custom designed and constructed to meet your special requirements. 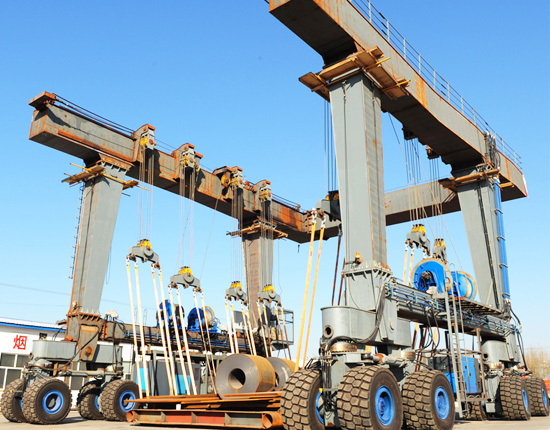 Our marine boat hoist is ruggedly constructed for heavy duty work year after year. In order to withstand harsh marine environments, we also use superior paint system. In addition, this equipment can be controlled remotely or within a cabin so that it allows the operator to get away from the load as well as reduces operator fatigue. Wire cable should be spooling properly. Our marine boat hoist for sale is at factory price. In the process of selecting a boat handling equipment, you should first make sure that you get the right type for your business. Here are some information you need to address in order to choose the right equipment. The specifications you require, such as rated load capacity, span, lifting speed and travelling speed. Power source you need, electric or hydraulic. Control mode your require, remote control and cabin control. What is your requirement for steering mode? Once you’ve gone through these questions, our travel lift professionals and sales manager will get together to help you select a solution that provides proper balance between cost, efficiency and suitability. The quotation process can take several days or more depending on the number of machines being quoted and the complexity of your project. 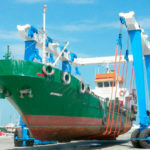 We promise to offer you an affordable and quality mobile boat hoist. 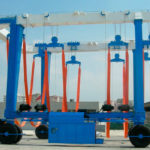 This equipment can also provide you with more versatility in the handling of large vessels. Place your order now! 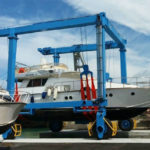 We have a wealth of experience in the design and manufacturing of marine boat lift hoist, in addition to that, we offer delivery, installation, commissioning and maintenance services on requests. 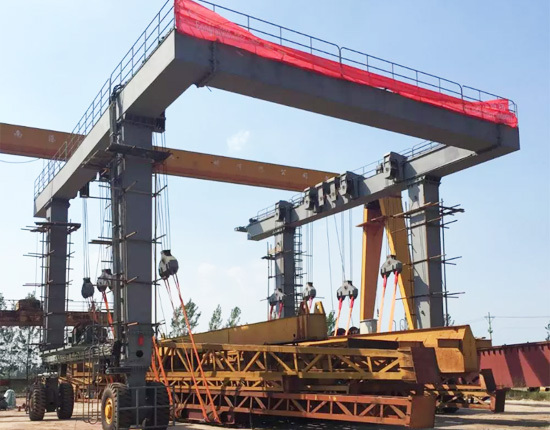 If you are working with us, you can benefit a lot from our high quality but low-cost products as each of our crane is constructed with quality steel, and its parts and components are sourced from trusted suppliers. Since we’ve established an after-sales service network which incorporates 8 overseas offices and more than 60 after-sales service engineers for overseas market, you can enjoy a perfect after-sales service. To get a discounted price for your marine boat hoist, contact us online today!